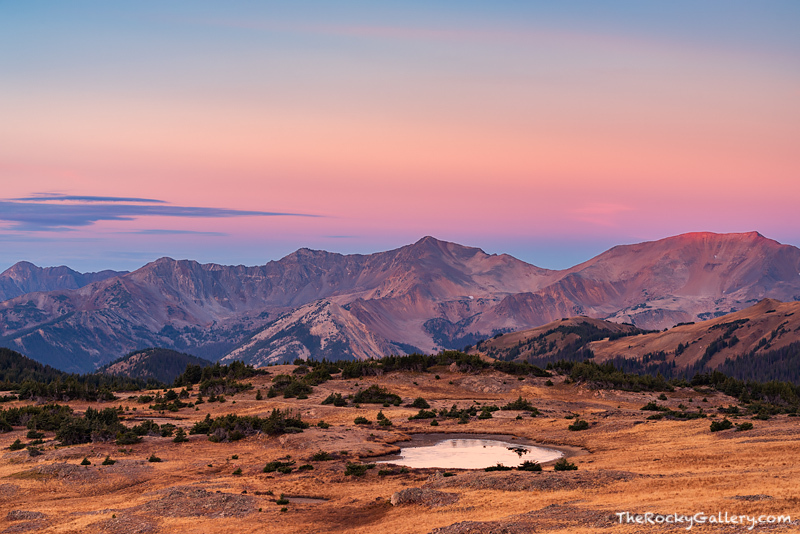 It's getting late in the season along the higher elevations of Rocky Mountain National Park. Though it's just past mid October on this day, the snow free alpine tundra and peaks of the Never Summer Range are only biding time before the winter snows settle in. The late autumn has colored the alpine tundra in golden reds and yellows and the alpine tarns are starting to collect a coat of ice on top of their surfaces. The first rays of sun illuminate the Never Summer Range will the Earths shadow, also known as 'Venus Belt' color the sky with hues of pink. Within a few days of photographing this beautiful scene, heavy snows fell and covered the landscape. The mountains were covered with fresh powder and Trail Ridge Road was closed for the season. Photo © copyright by Thomas Mangan.